Lama Zopa Rinpoche during Lama Chopa at Kopan Monastery on Lama Tsongkhapa Day, Nepal, December 2017. Photo by Ven. Lobsang Sherab. Every year the month-long lamrim meditation course at Kopan Monastery in Nepal draws more than two hundred students from around the world. And every year the November Course, as it’s called, fills up quickly. Many students starting planning to attend the transformative program months, if not years, in advance. 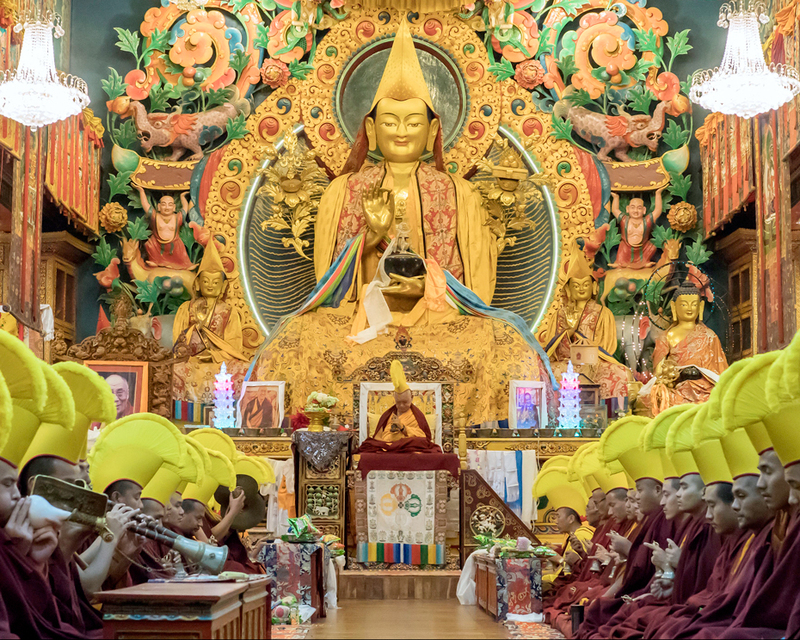 Coming to Kopan Monastery—attending one of the meditation courses—is to pacify the negative mind that brings all the problems, global problems. Coming here is to pacify that. You understand the point? It is most important. So you are coming here to learn meditation. What you are learning, that is the most important thing in the world, the most important thing in your life. That helps not only this life, it helps not only the next life, it helps hundreds and thousands, millions, it goes on, the benefit goes on and on. It goes on to enlightenment. Ultimately it goes on to enlightenment. Your coming here to do meditation—listening and meditating—all this goes up to enlightenment for numberless sentient beings. You achieve enlightenment for numberless sentient beings—for every ant you see in the road, in the gompa, every bird, every dog and cat, people, every sentient being—to benefit everyone, to free them from the oceans of suffering of samsara and bring them to buddhahood, peerless happiness, buddhahood. Colophon: Excerpted from Lama Zopa Rinpoche’s teachings at Kopan Monastery, December 8, 2017. Simultaneously transcribed by Ven. Joan Nicell. Lightly edited by Laura Miller, October 2018.